Either you dig in, invest and expand or, in essence, you don’t grow. That’s how David Kordansky described the decision to expand the gallery in Los Angeles that bears his name. By April, it is scheduled to span an entire city block in the Edgewood area below Mid-Wilshire. The compound’s center, designed by the firm wHY, will be tiers of landscaped stairs and an outdoor courtyard, both of which Mr. Kordansky said would be used for outdoor sculptures, literary events, symposiums and performances. Indoor exhibition space will increase to 7,000 square feet. For large and now even midsize galleries, custom architecture has become as important as it has long been for museums, with all-new or reengineered spaces to add restaurants, kitchens, gift shops, bookstores, and black box spaces and auditoriums for performance, film screenings and staged events. These changes reflect, in part, galleries’ need to keep up with the ways artists themselves have diversified their practices, interests and use of multimedia. Galleries are growing in this way most notably in New York and Los Angeles — arguably the two most important art centers in the United States — though both already have many of the country’s best and coolest visual and performing arts venues, restaurants and shops. “We know that we are doing more than transactions and that we’re part of the cultural landscape,” said Maureen Bray, executive director for The Art Dealers Association of America, a nonprofit that represents 180 galleries in 25 cities in the United States. Jeffrey Deitch, former director of the Los Angeles Museum of Contemporary Art opened his new 15,000-square-foot space in Hollywood last month specifically to mount what he described as “museum-level” exhibitions. The space was designed by Frank Gehry, the architect of some of the world’s most famous museums, including the Guggenheim Museum Bilboa in Spain and The Louis Vuitton Foundation in Paris. The inaugural show of large-scale work by Ai Weiwei includes as its centerpiece “Stools,” 2013, with nearly 6,000 wooden stools from the Qing and Ming dynasties and the Republican period that the artist collected from villages throughout northern China. “We’ve all read about the crisis in galleries, and it is true that attendance has declined because a whole generation of collectors thinks it’s O.K. to see art at the art fairs or on the internet,” Mr. Deitch said. 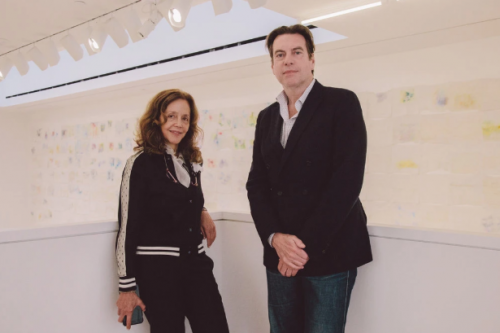 Whereas gallery exhibitions typically change every six weeks, Mr. Deitch plans an exhibition calendar more in line with art museums, where they may remain on view for months at a time. What else does “museum-level” mean to him? “It’s the scale, the quality of the space, the ability to present major works,” he said. “It’s the level of presentation. It’s the ambition and seriousness.” There will be no wall texts, of course, as you’d see in a museum. Also in Chelsea earlier this month, a show of new paintings by Walton Ford inaugurated Paul Kasmin’s new gallery, a ground-up construction by Markus Dochantschi of Studio MDA. The new 10,000-square-foot gallery, with a concrete ceiling that recalls the Brutalist designs of what is now the Met Breuer, is part of a mini-archipelago of four Kasmin exhibition spaces along one block of West 27th Street near 10th Avenue. The new No. 509 is less than 10 feet from The High Line, which curves along the gallery’s new 5,000-square-foot rooftop sculpture garden and attracts more than 6 million people annually — far more than many museums. Lehmann Maupin’s newest gallery space, designed by Peter Marino, opened its new three-story gallery in Chelsea in September, and on Thursday will inaugurate its nearly 2,000-square-foot black box space, with screenings of artist Catherine Opie’s new, first-ever film work, “The Modernist,” a stop-motion film compiled from nearly 900 of her photos as well as separate screenings of its inspiration, the sci-fi classic “La Jetée” (1962), while her photographs are shown in the main galleries. Ms. Lehmann added, “Museums have, unfortunately, budget constraints which are not getting better these days, so you have commercial galleries who have to take more responsibilities for being able to offer to artists more adventures, more ideas, and more spaces.” Though she believes that young people see gallery-going as a “leisure activity,” where getting a coffee at the gallery might be “normal,” the inclusion of food and beverage is not something she and her partner in the gallery considered. By contrast, in late 2019 Hauser & Wirth will open a new five-level 35,000 square foot complex designed by Annabelle Selldorf with a book and design shop, a study center, a screening room, an auditorium and a farm-to-table restaurant. Also next fall will be Pace Gallery’s newest space, designed by Bonetti/Kozerski Architecture, spanning eight stories across 70,000 square feet — 10,000 of which are outdoor exhibition space. Its seventh floor will be optimized acoustically to present new media works and live performances. “What’s pushing us in terms of these extracurricular activities is to see what happens when you stretch the gallery,” said Gavin Brown, owner of the multistory gallery in Harlem that bears his name. “I think collectively, unconsciously we are all thinking about how to reassess the communication of art and there are all these extraordinary tools,” he said. His gallery hosted a standing room only “record party” and conversation last year between Jason Moran, (the jazz pianist, composer and artistic director for jazz at the Kennedy Center who frequently collaborates with visual artists) and his wife, the mezzo-soprano and composer Alicia Hall Moran. Mr. Deitch agreed, comparing the gallery business “to retail, where just another store in a mall isn’t going to inspire anyone but the most dynamic retailers are creating experiences.” He conceded that “visitors want those amenities,” even though he personally opted for “no cafe, no restaurant, no bookstore, no souvenir shop” in his new Hollywood space.